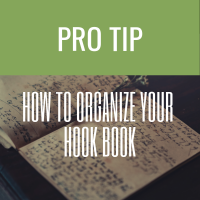 Organize your hook book! It’s one of the best things you can do to make sure you’ve got ideas and lines at your fingertips when you’re working toward your 300 song goal. It’s also handy to have something ready to toss out as a starter when you’re headed to a co-write, especially if you’ve never written with the person before. I’m a little bit right brained – a little bit left brained (but not related to Donny or Marie). So while I’m creative, I’m also a little OCO (obsessive compulsive order as my pal Todd would say). Naturally, I have an organization system for my creative ideas. It’s a bit of a mash-up of how several Nashville pros use their own songwriters notebook. My notebook has colour coding via highlighter, and a hand-drawn icon system so I can quickly find things. Say I’m co-writing and the person asks if I have any song ideas – not just hooks. Then I look for the yellow light bulb icon! Lyrics I’ve started so I can always make sure I haven’t lost them? Green plus sign inside a circle and on the left hand page. Great lines I didn’t use or a piece of a line I might have thrown away, or better, created during an object writing exercise that would be perfect for a song I’m working on? First task is to put the date on the inside cover. When I’m finished I’ll add the “through” date: 5/7/14 – 9/1/15. I save about 6 pages in the front of the book for hooks. I number the lines as I add hooks. I transpose any pink stars in my hook book to the front of the book so I have easy access when I’m in the mood to write. When I write one of the hooks either alone or as a co-write, I strike through the number and add a date of creation to the line (DOC) as well as the name of the co-writers(s) if there are any. I also number the book I just finished on the pages (book closed) on both the top and bottom with a Sharpie. Use whatever the next number in the sequence would be: 1, 2, 3, 4 etc. I leave the new book unnumbered. That way, I know it’s active.